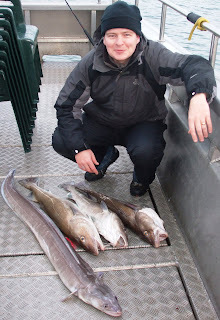 Our first winter cod trip of 2010. 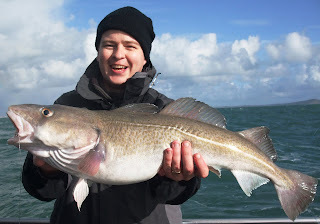 The wind was fresh but it didn't stop 2nd time boat angler Richard Potter from boating an amazing haul of 3 cod - 18, 11 and 10lbs and a 20lb conger. Thanks for a great days fishing yesterday. I cant believe my luck especially as it was only my second trip out on a boat. I'm looking forward to a great dinner tonight (my wife had cooked lamb shanks last night as she didnt expect me to come home with anything). 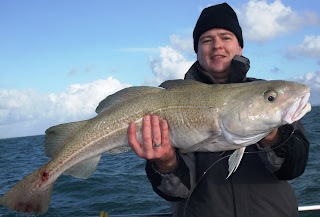 I shared the 3 cod between myself Adam and Scott so we all had something to take home and cook. Adams going to make a thai curry out of the conga so I will look forward to trying that next week. I think you will be seeing the three of us again soon. Hope Richard will tell us how the Thai Conger Curry tasted!! 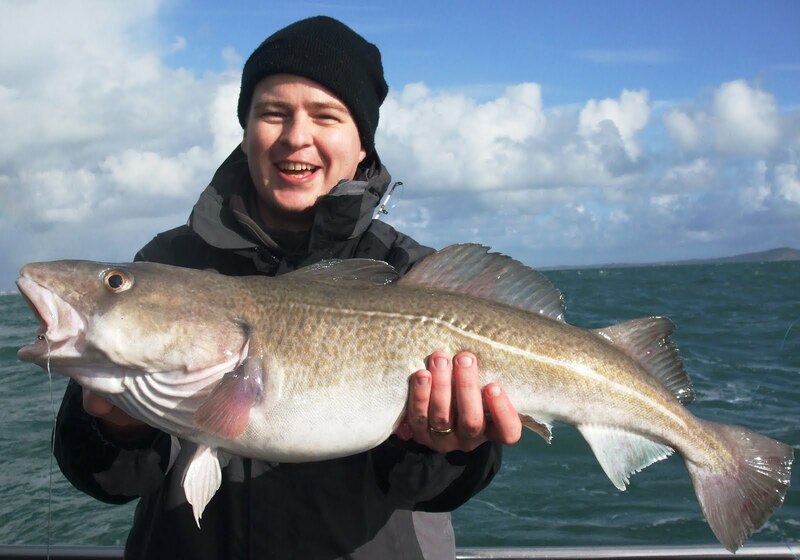 Fishing at anchor over the last neap tide has been good with the youngsters proving that they have got what it takes to keep up with the older anglers. Along with a good few double figure bull huss we have had the usual congers and even a surprise bass on a mackerel skeleton. Looking forward to the winter cod season in both freshwater and poole bay. Two days fishing on the shambles certainly exceeded expectations in less than favourbale conditions with 16 brill and 13 turbot brought to the boat. The wild card for the couple of days was Dave Williamson with his new boat record 6lb 8oz tub gurnard on the slack on the second day. 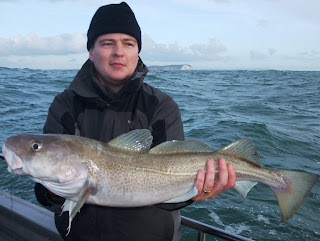 The fish came on a normal turbot bait and gave a very good account of itself. Monday 4th october - an excellent day had by all aboard Silver Spray. Not only did we equal the most flatties we have had in one go on the shambles with 9 turbot and 4 brill we also had some nice black bream on the slack. After hurrendous weather on sunday I was happy to see blue skys all day long. Although fresh bait was scarce the fish seemed to be more than pleased with frozen mackerel.